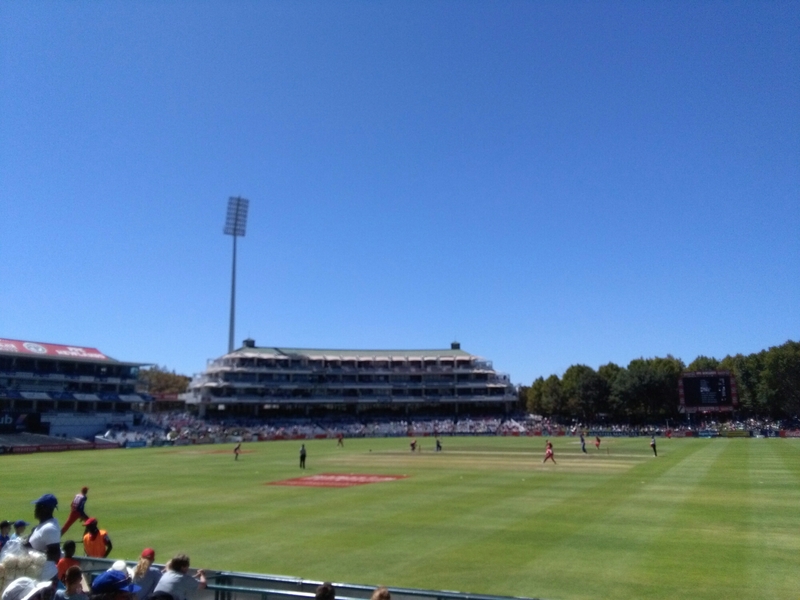 Sunshine, blue skies and cricket this is how Capetonians spent their Sunday as the Cape Cobra’s took on the Highveld Lions in the Momentum One-Day Cup final at Newlands. The home side (boys in blue) lost the toss and were put into bat first, this seemed to be a good call for the Lions as it took them only 40 overs to bowl the Cobra’s out for 169. This was not what the fangs expected as our boys were doing so well in the build-up to the final. 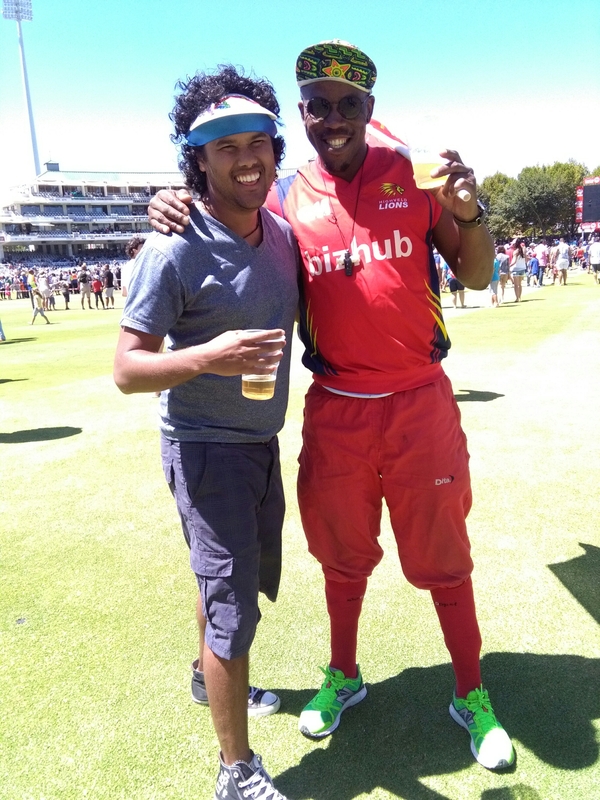 With The Stormers winning against The Bulls yesterday in the Super Rugby Match we still had hope for a major turnaround…..we had faith in our bowlers even though defending such a low score in a final was shocking. 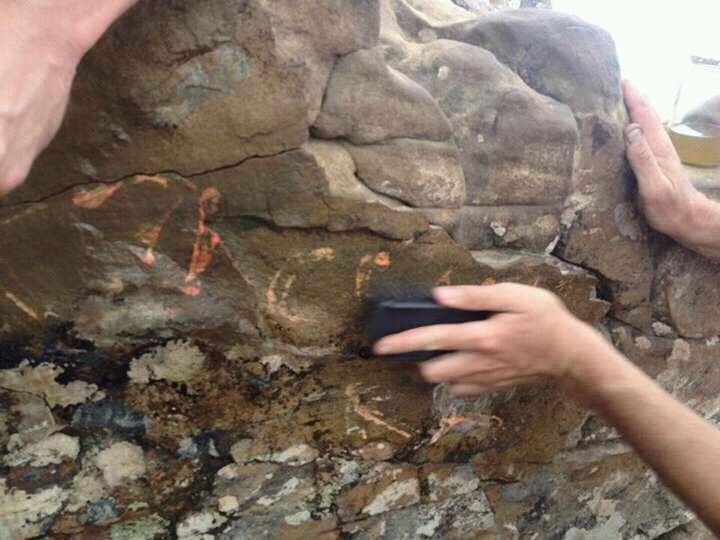 …ok wait I think the Castle had something to do with it. After the break it was the Cobra’s turn to bowl but things just went from bad to worse for the home team, it was like they didn’t realise this was a final or they were considering the fans who still wanted to catch the 7de Laan omnibus. The Cobra’s only managed to take two wickets to allow for a convincing win by the Lions, an 8 wicket haul. The three Lions fans in the stadium were happy….Weldone to the Momentum One-Day Cup Champions of 2016. 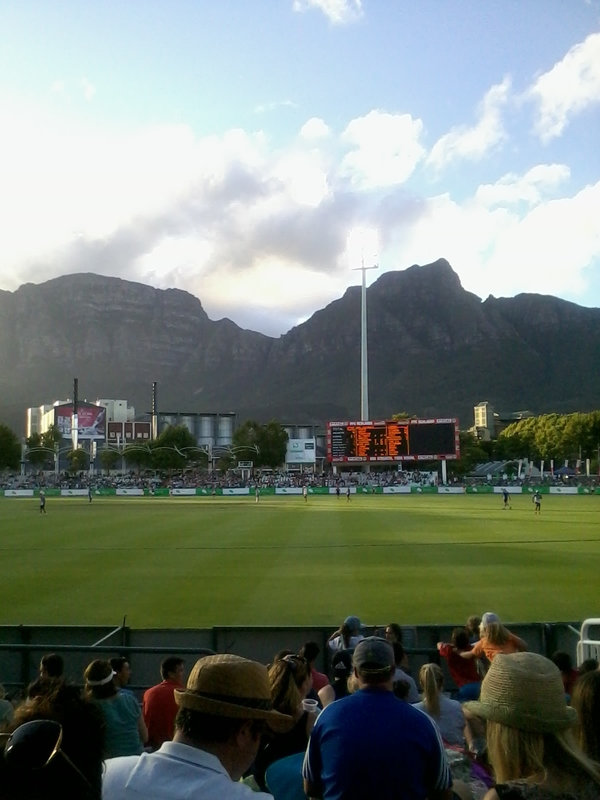 Now we look forward to the T20 clash between Australia and South Africa at Newlands. PS: At least I got to catch the second half of United beating Arsenal 3-2 just saying. This entry was posted in Uncategorized on February 28, 2016 by shaunjengel. 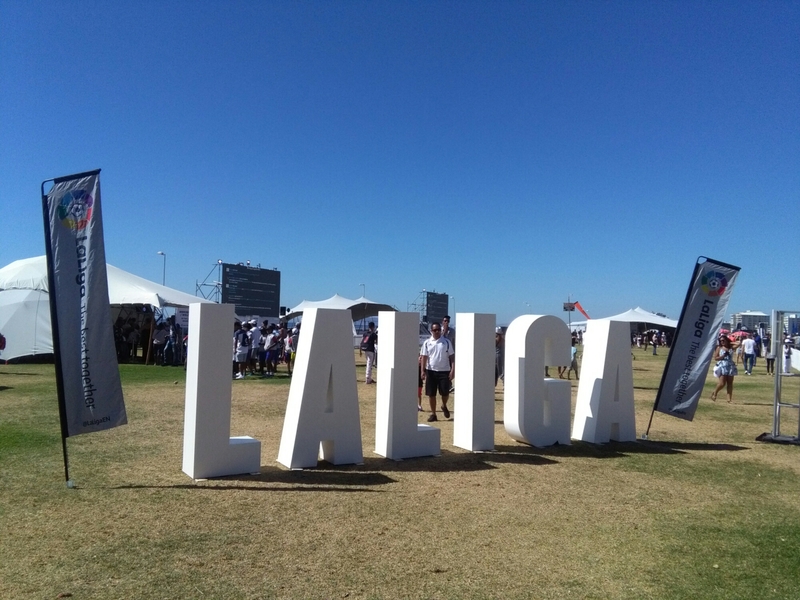 Mention Valencia, Barcelona, Atlético Madrid and ofcourse the Real Madrid you’ll know we talking about LaLiga right? 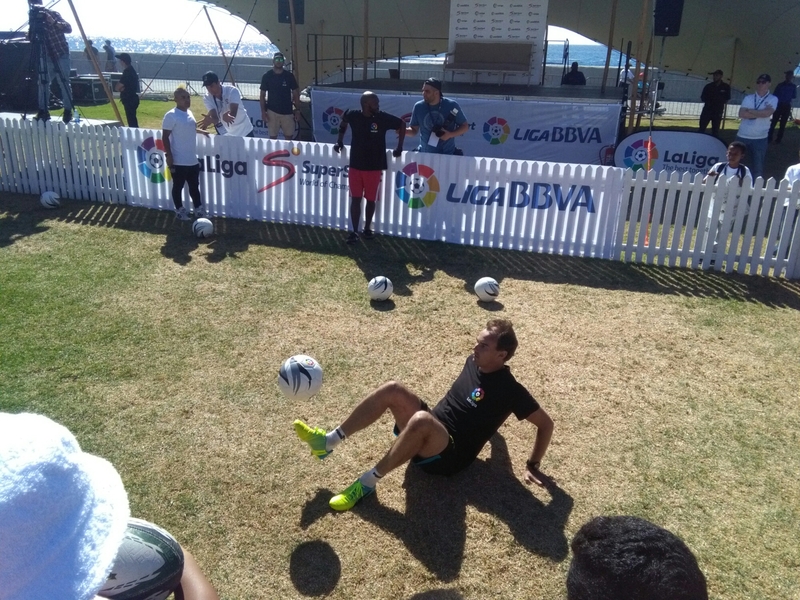 The free LaLiga fan day on the Seapoint Promenade invited fans to rub shoulders with Spanish Legends and some local stars too. 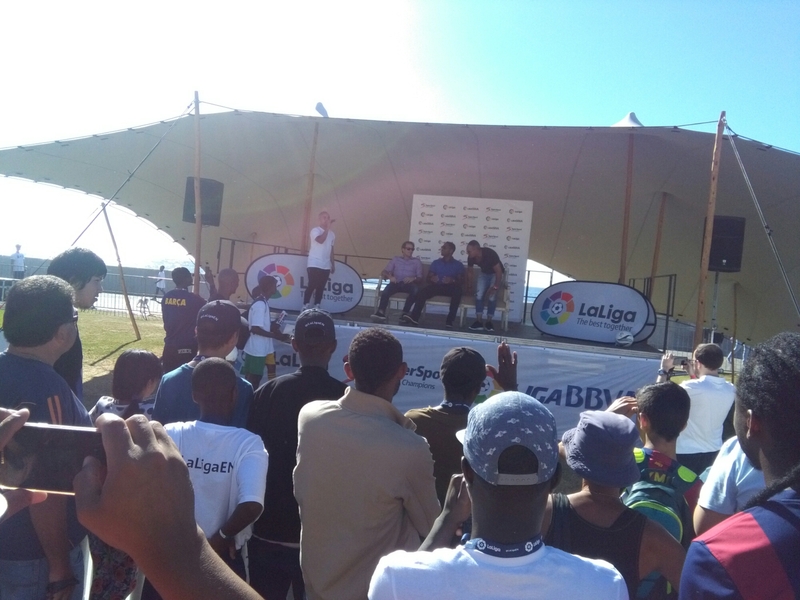 A surprisingly informative Q&A session in which in-depth questions were asked from the panel consisting of Gaizka Mendieta, Patrick Kluivert and local Bafana superstar Stanton “Stiga” Fredericks, the answers from the legends were both inspiring and motivating for many of the young athletes in attendance. 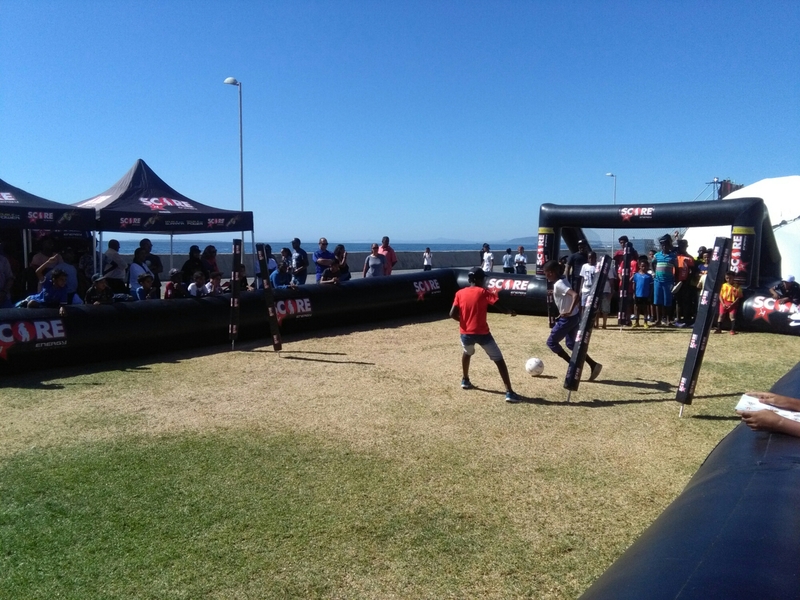 The Cape Town sun made for a great day out with the family in which the kids could make new friends playing five-a-side football in the score arena..
Or have their picture taken with the Spanish league trophy and replica jerseys like our local celebs.. 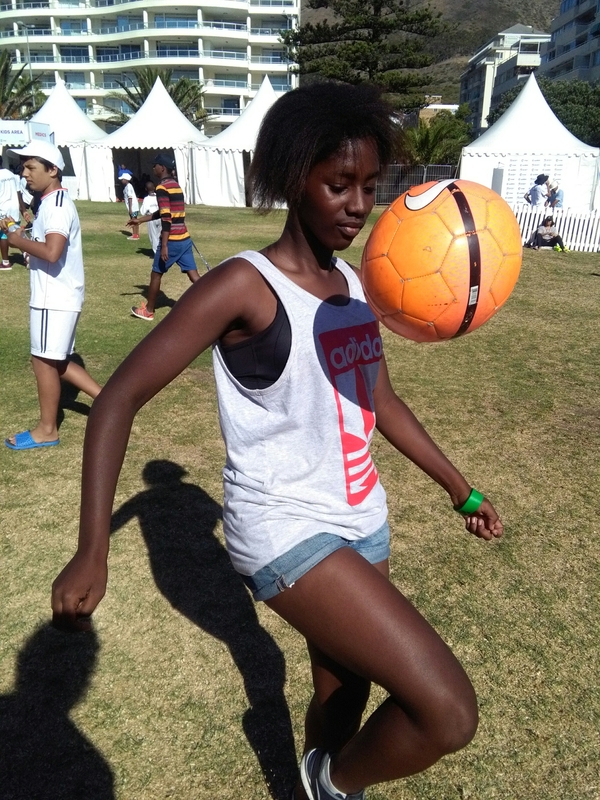 If you think football is just for boys, think again there were some girls who will put you to shame with their knowledge and skill of the beautiful game. If this was not enough the fans were also entertained by some freestyle footballers before the kick-off to the Madrid Derby, the skills displayed were insane. Once kick-off arrived we enjoyed the game on two big screens, not quite the goal fest I expected but entertaining non the less, a rather Messi affair as Barcelona were only expecting a draw. In the end Atlético Madrid win Real Madrid 1-0 keeping their hopes alive which I doubt will happen. 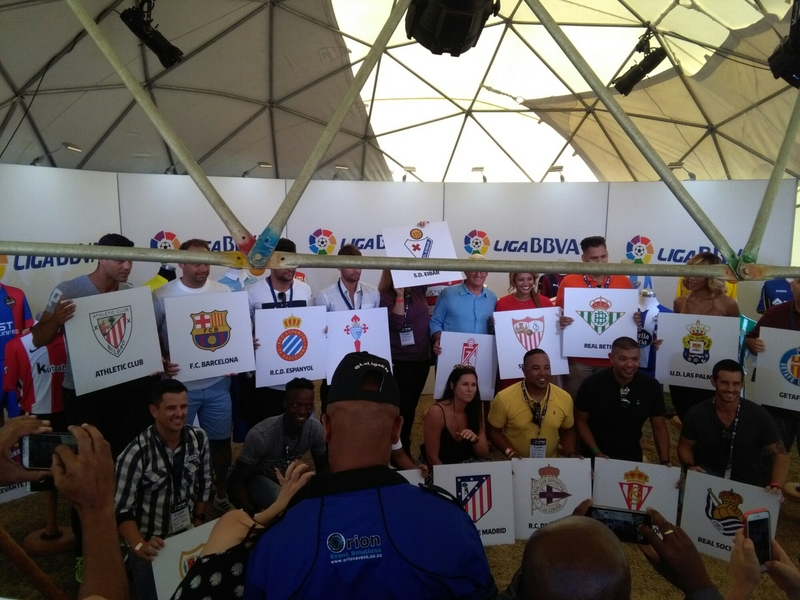 An awesome day and initiative which made one lucky fan happy as he gets to watch a Spanish Football match of his choice next season, judging by his shirt the Camp Nou should expect a crazy Capetonian fan next year. This entry was posted in Uncategorized on February 27, 2016 by shaunjengel. 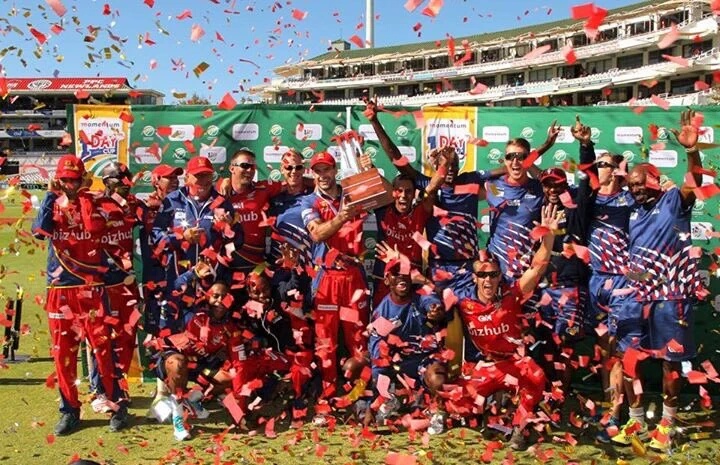 After an epic T20 encounter between South Africa and England where Chuck MORRIS literally won the game for the Proteas on the last ball…Newlands will once again host a Momentum One Day Cup final. 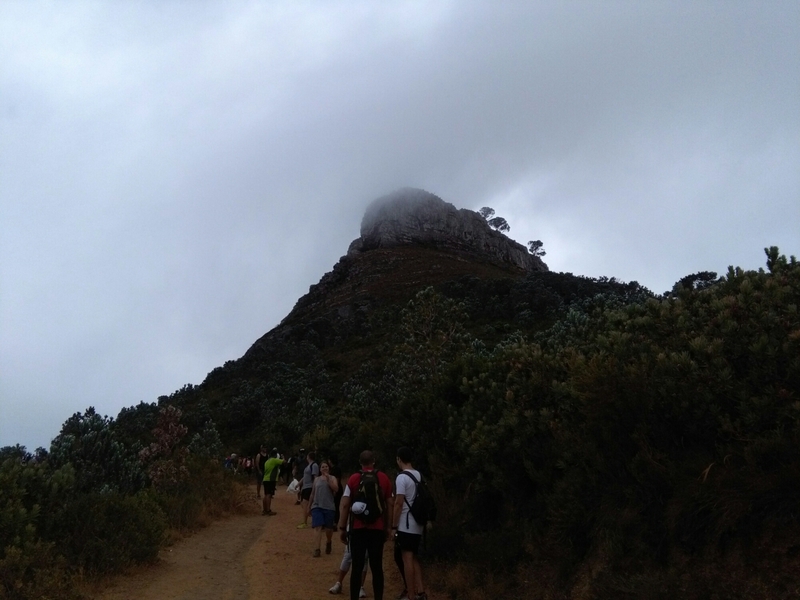 Home of the Cobra’s this beautiful setting is where the fangs of the Cape Cobra will bite into the Highveld Lions and hopefully draw blood by keeping the Cup in Cape Town. Let’s get behind our boys and from a sea of blue as we wave our flags!! 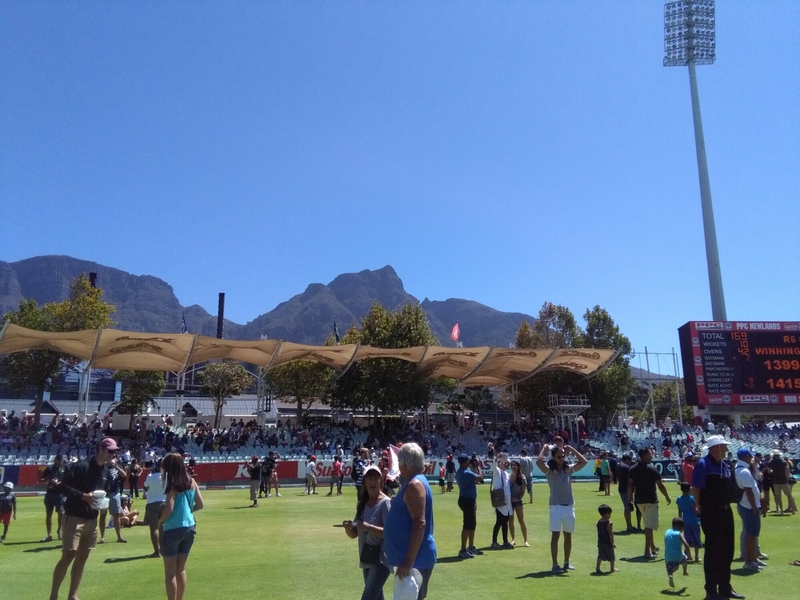 This is sure to be one exciting day of fun in the sun so bring the family and friends……let’s fill Newlands and show them we love cricket. Purchase your ticket to this exciting cricket today and you will be entered into the lucky draw for R5000 during the lunch break. 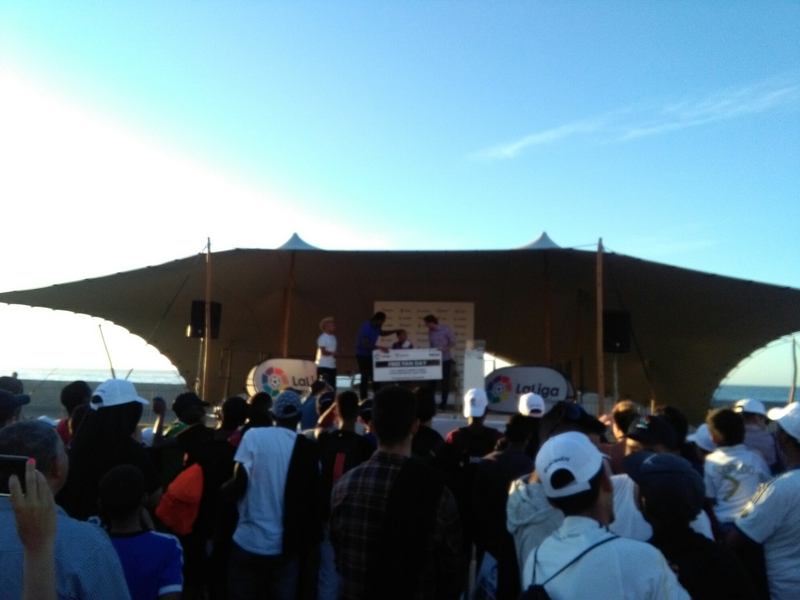 TWO people can win R5000 each IF they claim their R5000 prize within 5 minutes of the announcement so hold onto your tickets!. 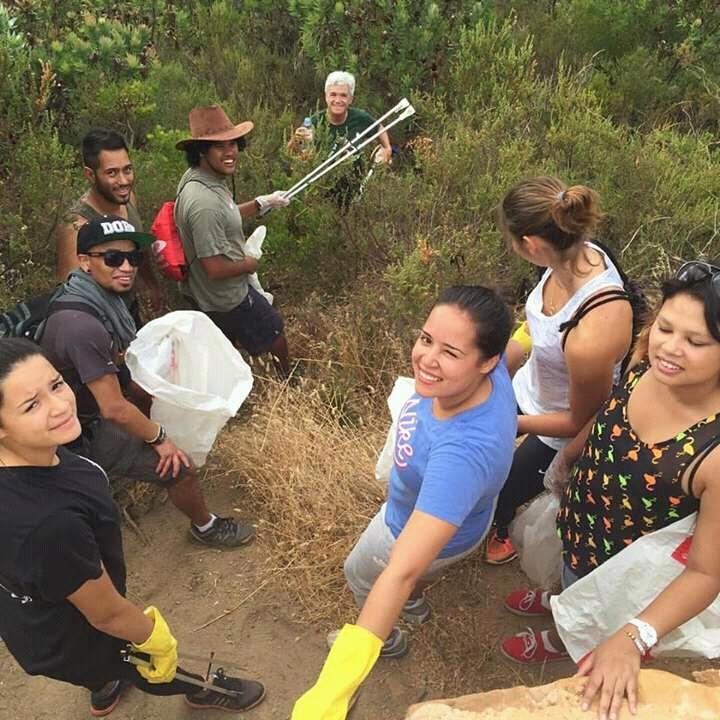 #R5kIN5mins ONLY at PPC Newlands, THE place to be! (T&Cs Apply). The first 100 FANGS who enter the turnstyles wearing blue between 9am – 10am will receive a Cape Cobras flag (While stocks last) so get to the game early! 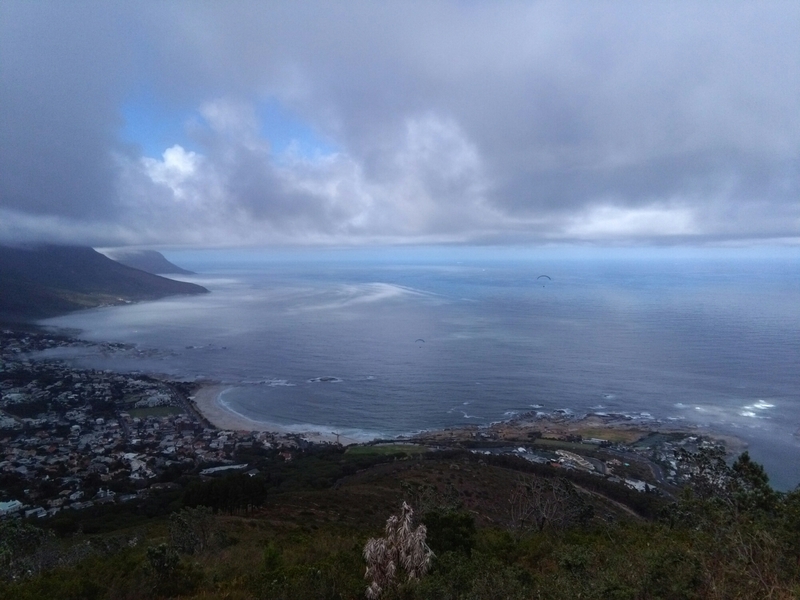 When the Stormers beat the Bulls on Saturday I will be partying through the night so I think I’ll be the first one at the stadium on Sunday – just saying!!!! CAPE TOWN are you ready!!!!!! This entry was posted in Uncategorized on February 25, 2016 by shaunjengel. 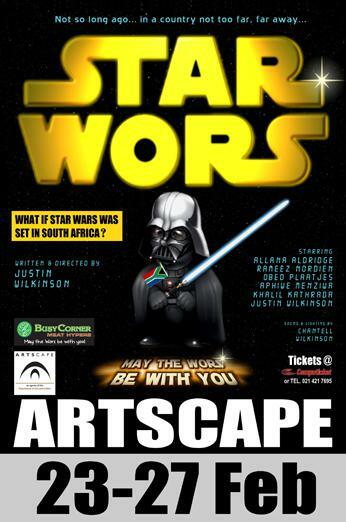 In a galaxy far away…..ok not so far away it’s actually in plain site, comes a comedy show that will awaken the wors within you. Don’t worry if you lived under a rock for the past few months this show will get you up to speed, after 60 minutes you’ll still be confused about the difference between a droid and a robot…. 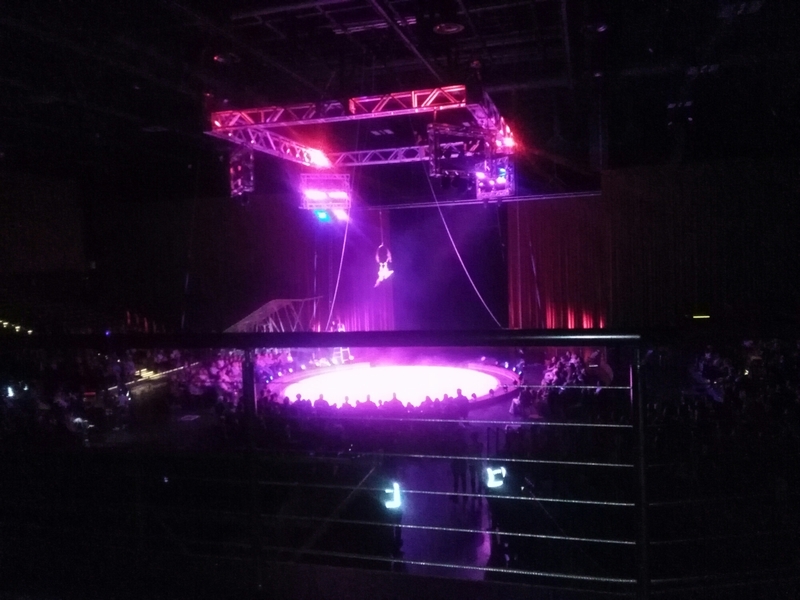 Well arranged and a witty performance by all characters it will have you in stitches from start to end, the perfect setting for an intergalactic battle of epic portions…..so get out of that Busy Corner and make your way to the Artscape Arena from Tuesday, 23 to Saturday, 27 February 2016, you’ll not be disappointed. Tickets to this event are available online via Computicket.com costing between R40p/p and R80p/p, depending on the ticket type. This entry was posted in Uncategorized on February 24, 2016 by shaunjengel. 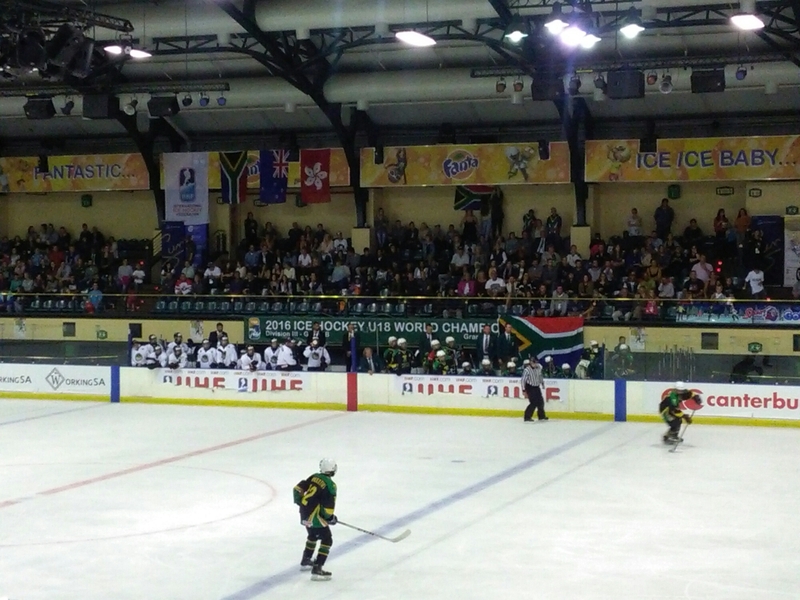 South Africa played host to the IIHF U18 World Championships in which Hong Kong, South Africa and New Zealand battled it out for top honours. 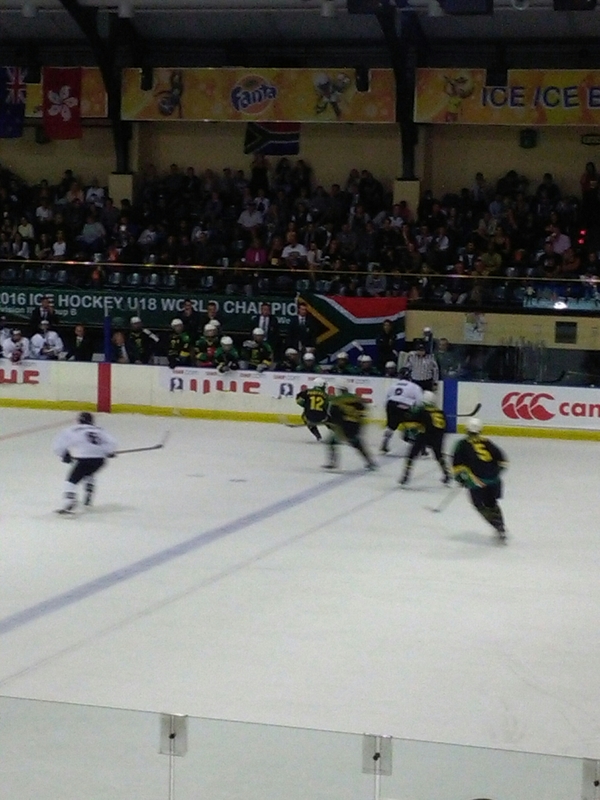 The final game saw New Zealand take on South Africa, the crowd firmly behind the home side. 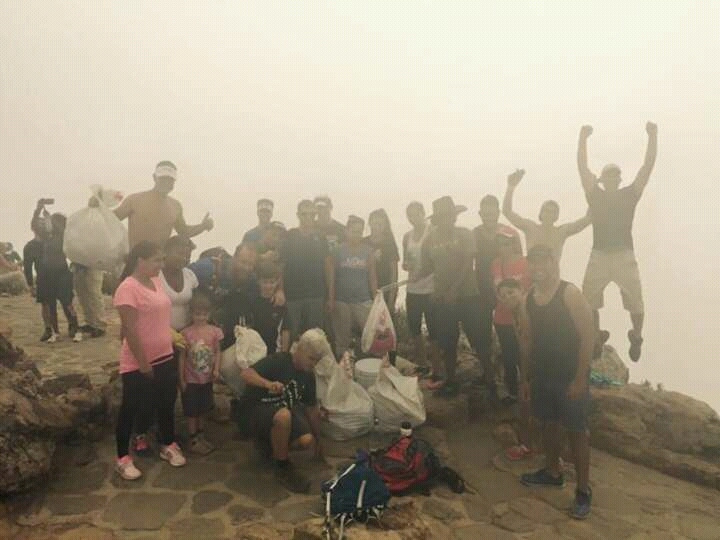 Rocket Rhino the SA mascot having a jol taking selfies with the fans. 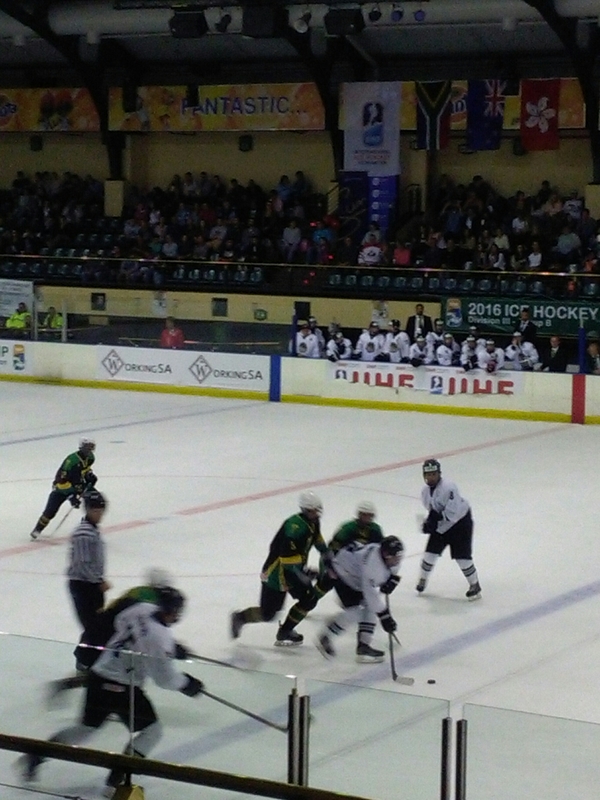 On the ice however it was New Zealand who brought the heat as they pummeled SA in the first quarter 3-0. The second quarter was abit more challenging as things got messy hard hits made me think is that legal haha, at one point New Zealand had three players in the sin bin but SA could not capitalise,the score ended 4-0 New Zealand scoring with 19 seconds left on the clock. After the half-time break the coach probably gave the team a stern talking because they scored within the first minute of the 3rd quarter. 4-1 hmmmm this gave the fans something to scream about and it was brought forward in the SA team as they started pushing forward. 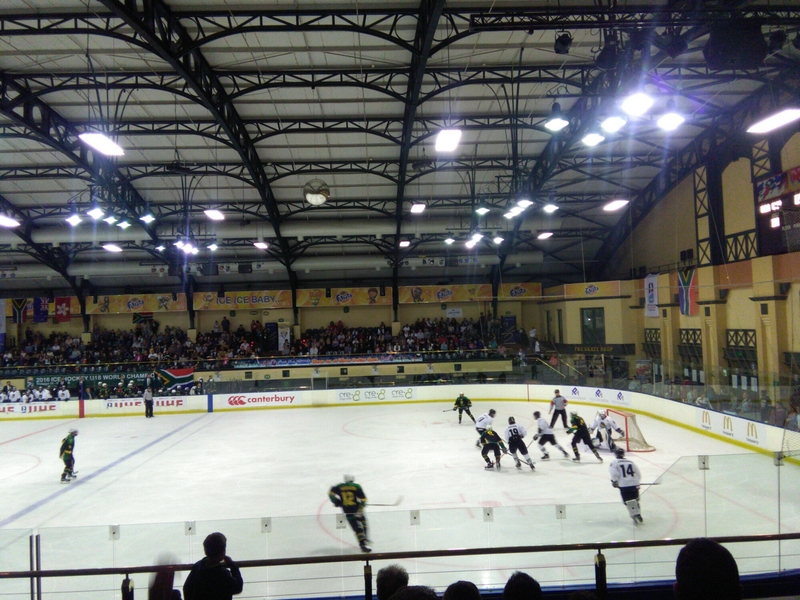 It was full on action in the 3rd quarter ice flying everywhere 4-2 oh yeah this looks like comeback…. Unfortunately it was short lived as New Zealand came back making the score 5 – 2, in the last quarter thing seemed to have turned for the worse as New Zealand netted another 2 goals to make the final score 7-2 to the Kiwi’s. 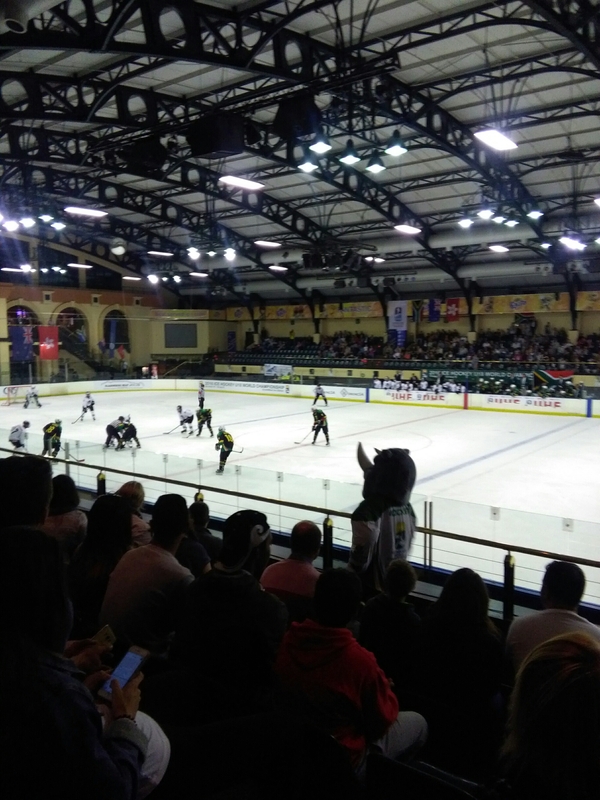 Well done to all participating teams and to the Grandwest Ice Station for bringing us another amazing event. This entry was posted in Uncategorized on February 19, 2016 by shaunjengel. 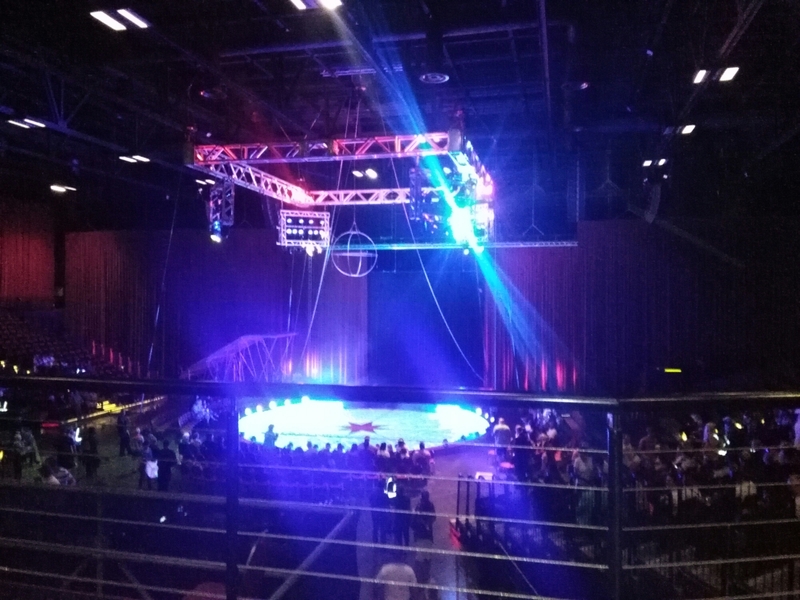 The stage was set, the crowd gathered and once the first performance entered the circle we were kept on the edge of our seat for the full 2 hours. 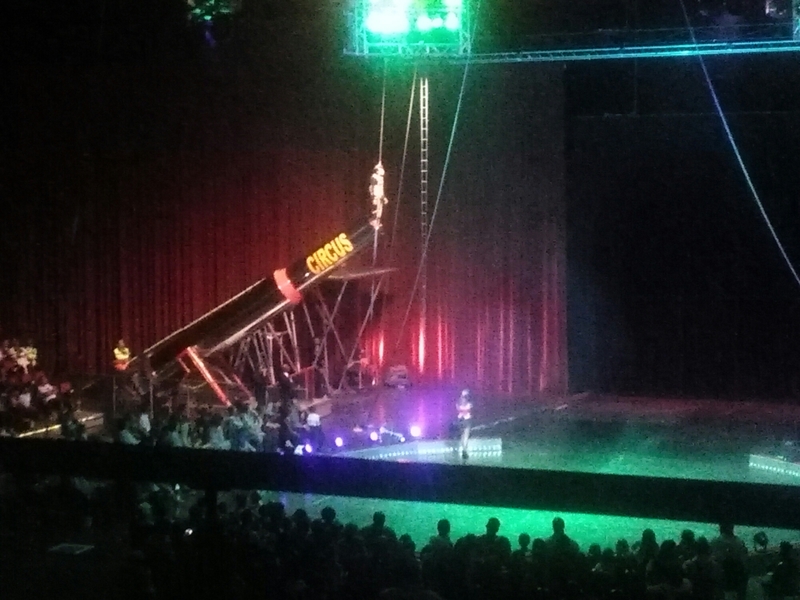 This was a circus with a difference, lots of surprises and I am sure some records were broken as things got really intense inside the Arena. 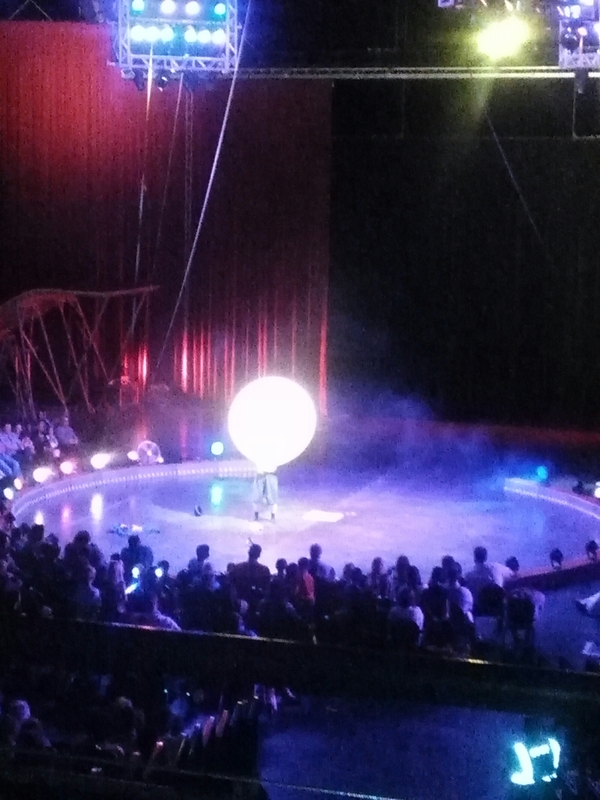 The energy from the performers were amazing especially the clowns between acts…..clowning around can be so much fun right!!! If that was not enough the finale GLOBE OF DEATH is a must see, even though you want to close your eyes at the thought of the safety of these riders…Do not blink because you’ll miss this spine tingling act. AUSSIE AUSSIE AUSSIE……OY OY OY. This entry was posted in Uncategorized on February 14, 2016 by shaunjengel.